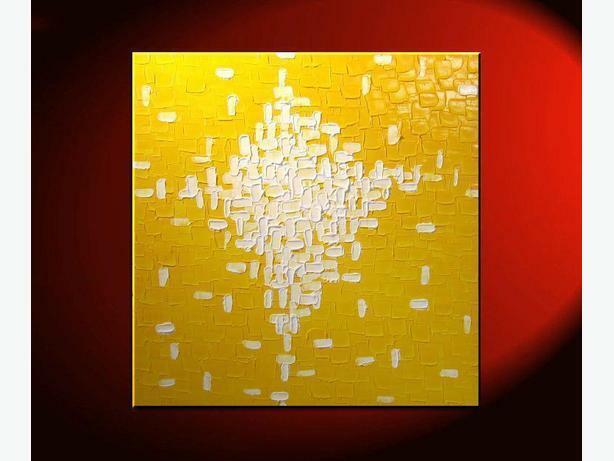 Title of the painting "SUNSHINE"
30" by 30" over a stretched canvases, 1" deep. What a joyful original knife painted abstract! The bright colors are sure to bring joy into your day :) There is deep texture in this painting that makes you want to run your fingers over it. This contemporary abstract piece measures a 30"x 30". It is painted on 1" hand stretched, gallery-wrapped canvas with the edges painted black, and a protective glossy varnish is applied to make this painting last. This painting is a great size for above a couch or an amazing focal point in your bedroom!